The entire south side of the church is visible from the tall windows offering views of the splendid rose window with its stain glass and intricate tracery stone. 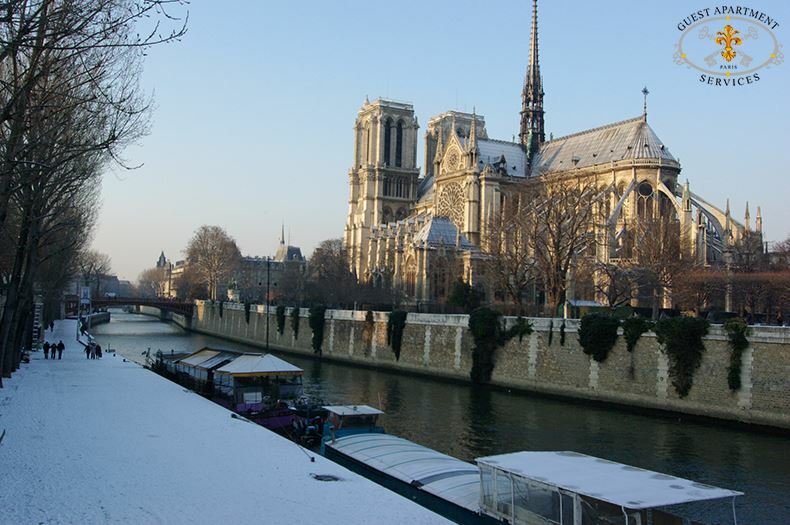 Stunning view on the Seine River & Notre-Dame Cathedral. 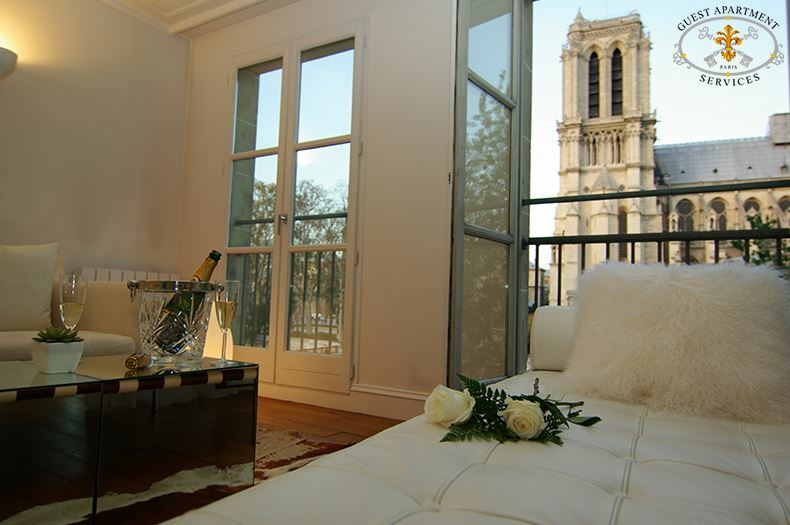 Escape to the City of Lights and live in this luxury apartment with breathtaking views of Notre Dame Cathedral and the Seine River. 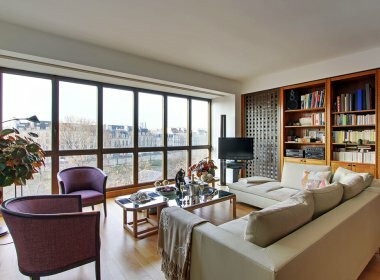 A magnificent one-bedroom vacation rental, designed by celebrity interior designer Benjamin Noriega-Ortiz, it is newly renovated but preserves the original floor-to-ceiling French windows offering you the best views of Paris. 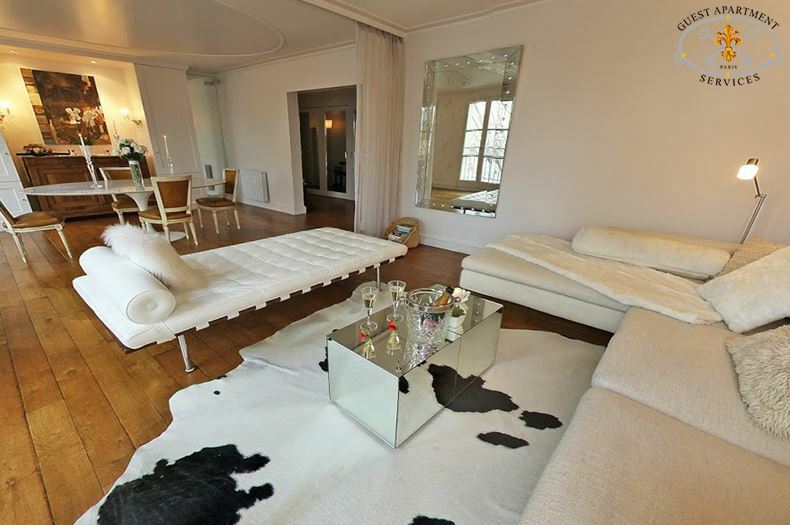 This light-filled luxury rental is located in the heart of the city along the Seine river. 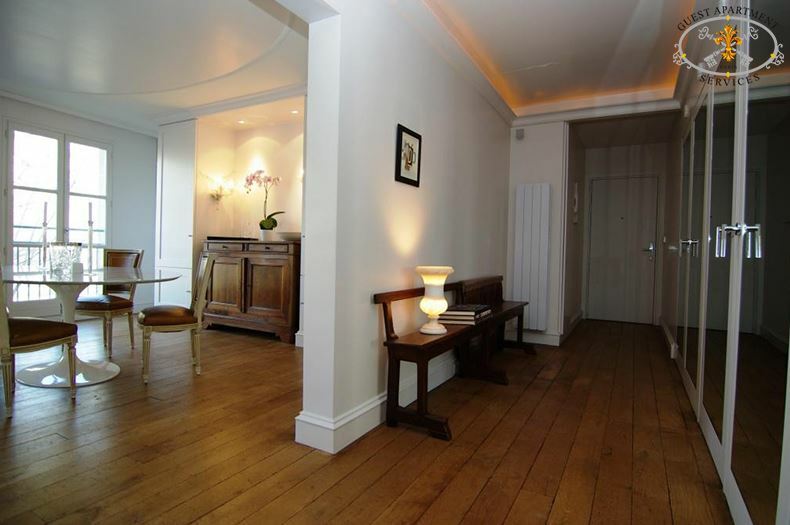 This luxury apartment is within easy walking distance from the subway stations "Saint-Michel" and "Maubert-Mutualité". 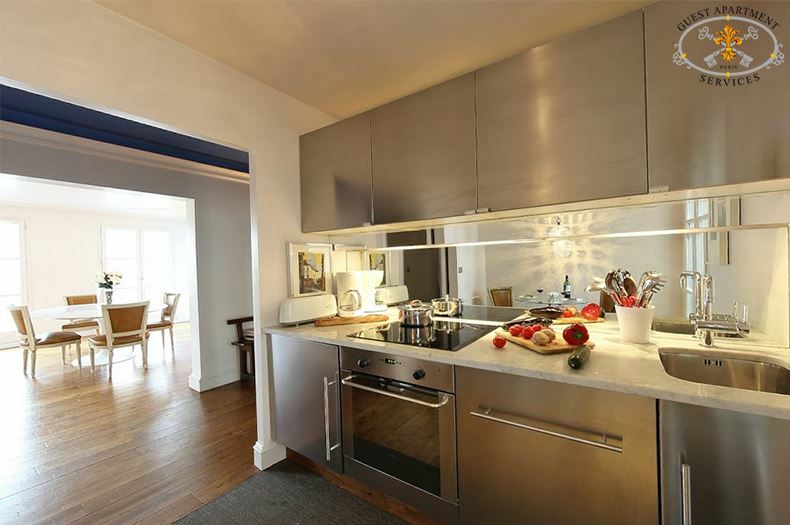 You have all the necessary conveniences at your disposal: bakery, pharmacy, post office, groceries, restaurants, fine shops with typical fresh French products. 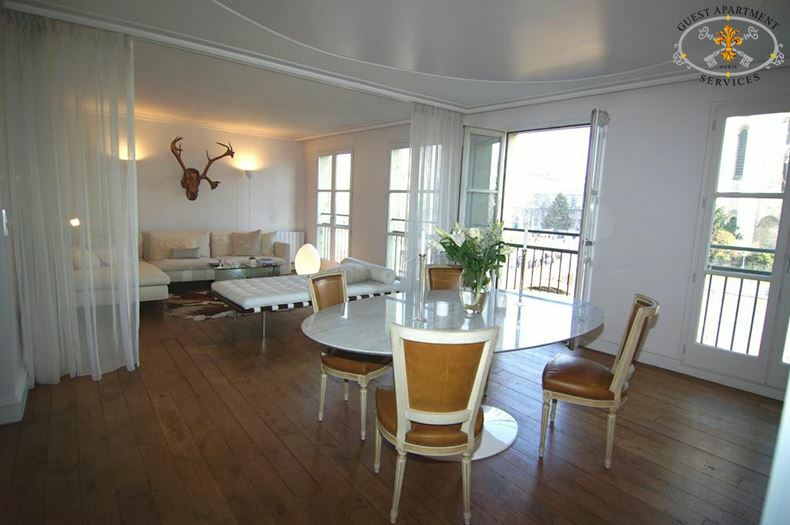 Other nearby conveniences include some of the best dining in the 5th arrondissement of which the world renowned La Tour d'Argent" restaurant is less than five minutes walk away. 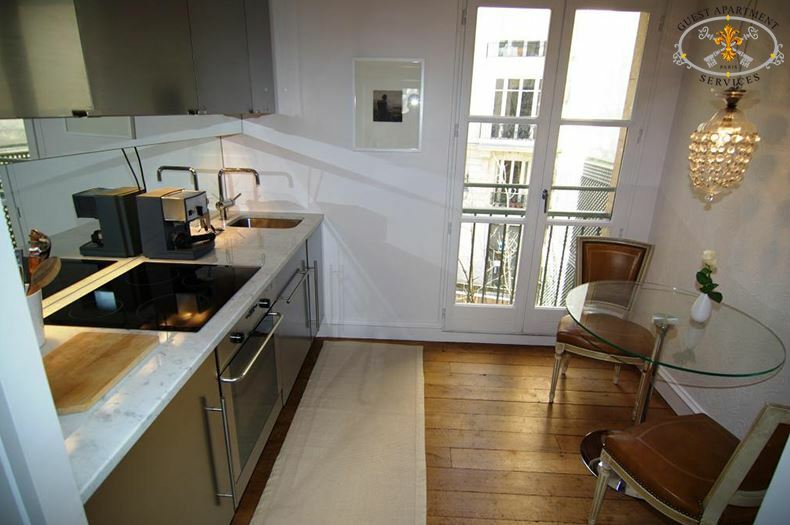 The major attractions such as the Louvre, Notre Dame Cathedral, Sainte Chapelle, the Pompidou centre, the Marais are all within 15 minutes walk of this apartment. 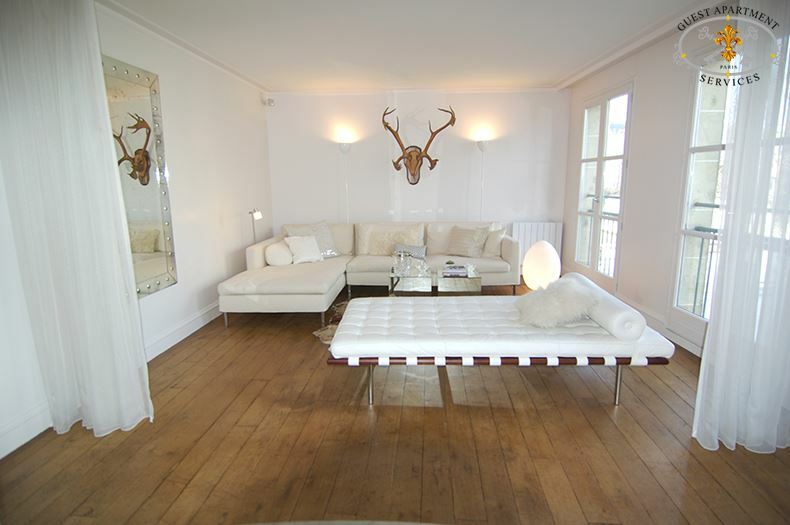 Great charm of a recently renovated Parisian residence by renowned architect Benjamin Noriega-Ortiz. 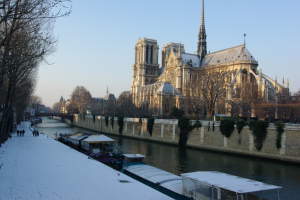 Four tall windows offer light, cross breezes and one of the most stunning views of Notre Dame Cathedral. 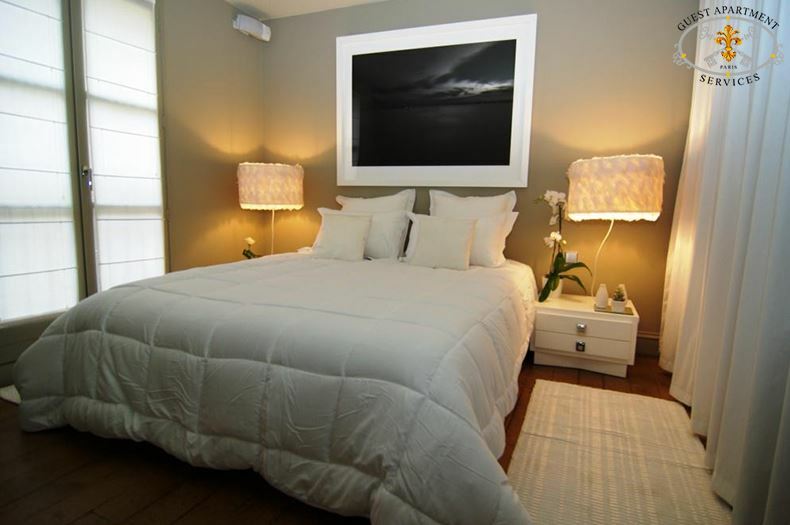 Antique and new luxury amenities are complimented by natural, ambient and even whimsical lighting. Soft atmosphere is created by a combination of architecture, color, furniture and lighting. 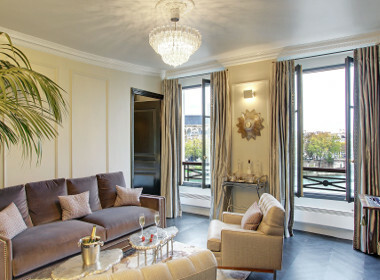 The salon has been organized into a living area with a sectional couch, leather meridian and mirrored cocktail tables. 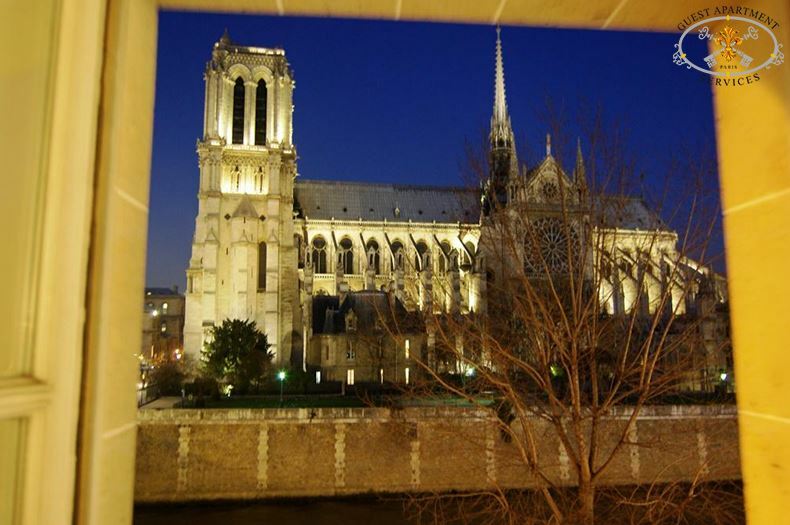 From every position in the room there is a view of the cathedral. Sheer curtains frame in this space and visually separate the living room from the dining room. 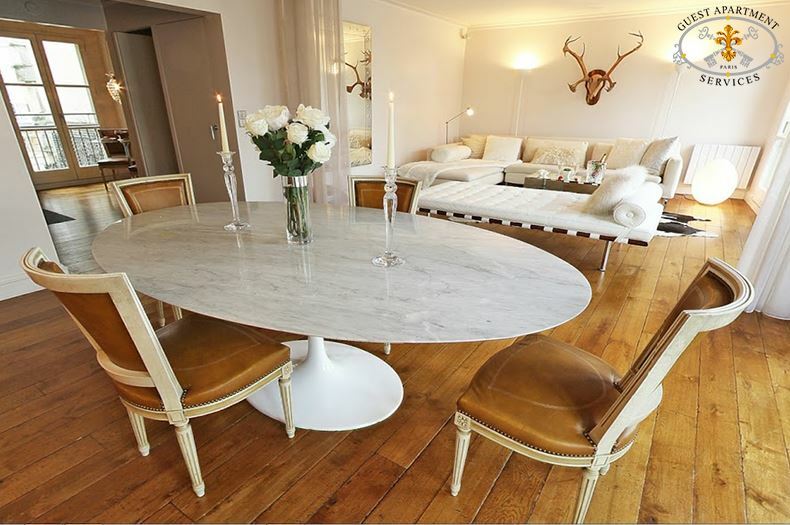 The dining area consists of a marble topped Saarinen table with comfortable seating for 2 to 4 persons. An antique buffet holds all the necessaries for setting the table. 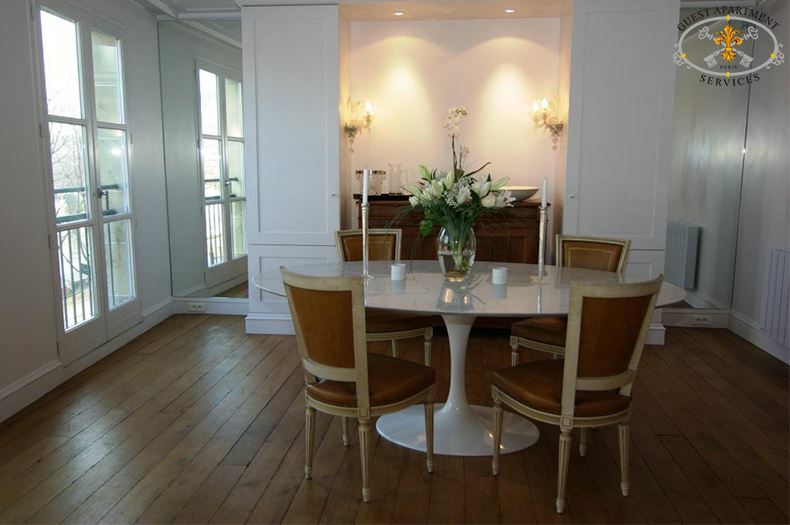 The combination of furniture from different periods creates a very elegant setting for your meals. The kitchen is open off of the hallway and offers a charming space for breakfasts. 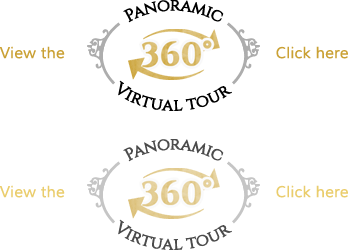 There is a full range of appliances: refrigerator, freezer, conventional oven, microwave oven, infrared ceramic cook top, coffee maker, toaster, silver ware. There is a full sized washing machine and separate dryer hidden away in a hallway closet. 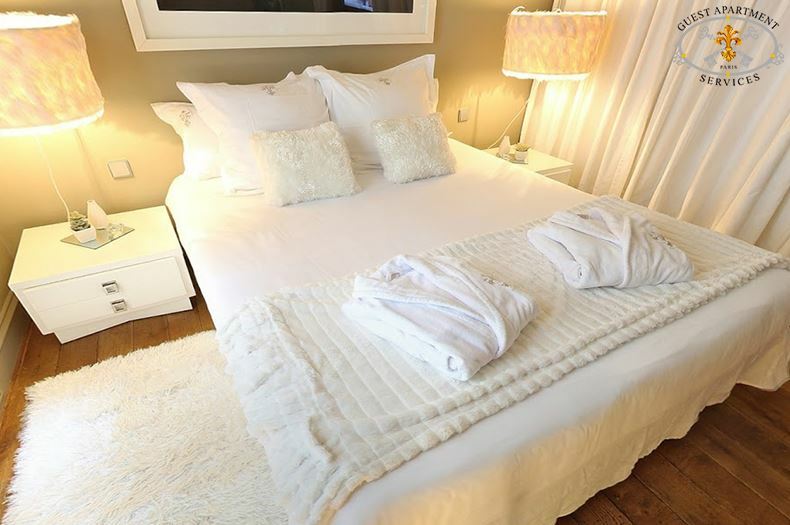 The quiet separate bedroom offers a New King sized bed ( also convertible in twin beds) in cosy and intimate style. 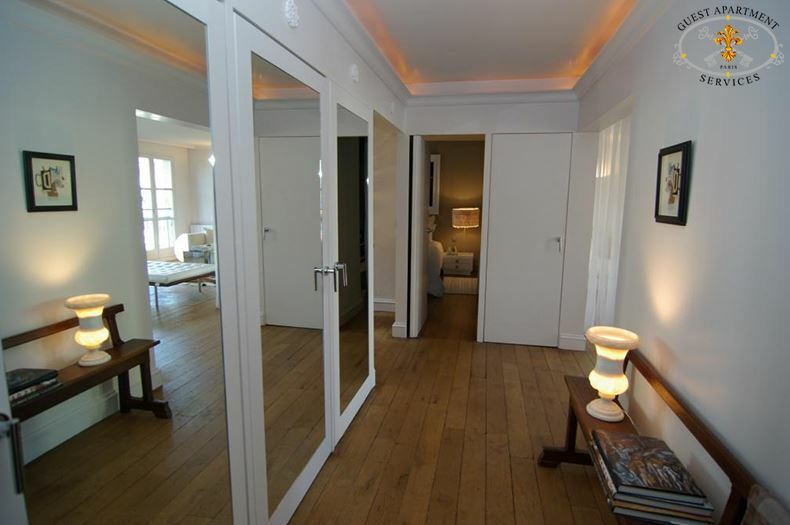 A wall of linen drapes hides the large closet as well as the home entertainment system. The floor-to-ceiling window faces south. 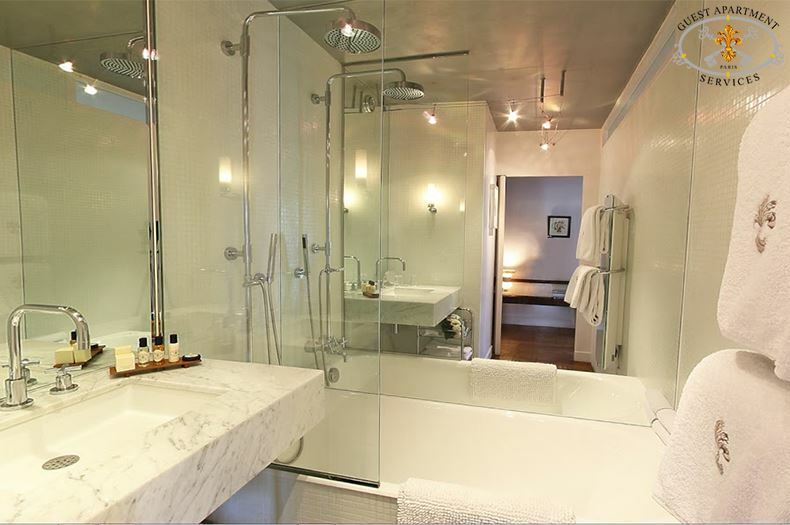 The bathroom is equipped with a full sized bath tub, shower fixture, lit white marble washbasin, mirrors and towel warmer. 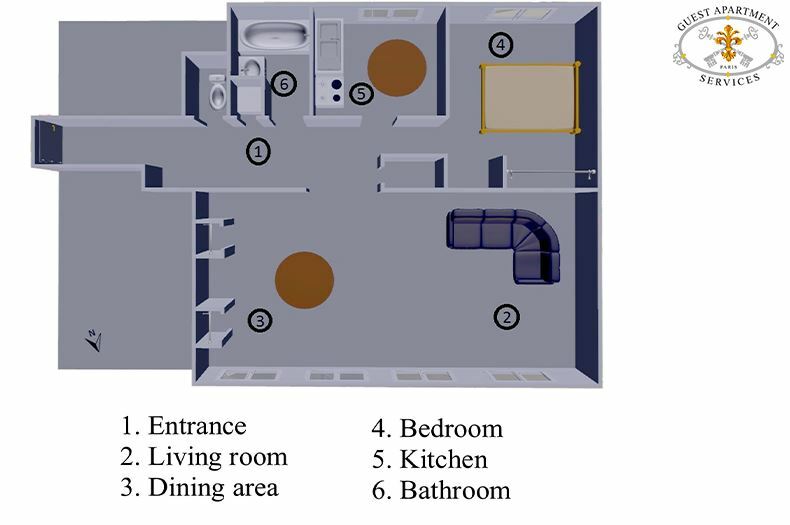 A hair dryer is available in the apartment. The WC is separate and accessible from the hallway. This apartment is equipped with multiple radiators for plenty of warmth. 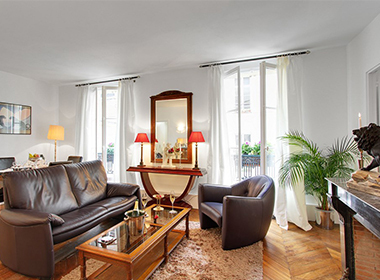 Additional appliances for this Paris serviced apartment: Complete hi-fi stereo with CD player, large flat screen TV equipped with cable of which CNN and main international channels, and private telephone with an answering machine, espresso maker.